In terms of the debate between “atheism” and, let’s say, “Religion” (this time with a capital “R”), the contrasting perspectives of these two books provide an interesting rubric through which to think. “Atheism” follows Berger’s position in The Sacred Canopy: there is no valid distinction between “religion” and “faith” (or between “religion” and “Religion,” for that matter). The apparent nakedness of “faith” is actually just another layer of a culture’s “R/religion,” and both are totally undermined by the abyss of relativity to which the science of sociology exposes us. By this view, really stepping outside of “R/religion” necessarily entails atheism – and as long as the debate is framed in this way, it will appear as though “R/religion” can only be sustained by fideism and fanaticism, by a stubborn refusal to think, by an irrational rejection of the truth of science. Contemporary atheists like A. C. Grayling and Sam Harris adopt essentially the same position: that “R/religion” is by definition fanatical adherence to unquestioned cultural norms, and that the perspective of “faith” is just a modern innovation concocted by people who have come under the dissolving influence of modern scientific rationality. Speaking historically, it is not difficult to show that this understanding of the God of “faith” is grossly inaccurate. For example, at the end of book VII of Plato’s Republic, the perspective of philosophy is presented as the quest for our “true” parents (this would be akin to Berger’s “faith”), after we have realized that the culture in which we have been raised is really just an adoptive parent (Berger’s “religion”). However, a remark that Origen makes in his Homilies on the Song of Songs is significant not only historically, but also ontologically, as a way of understanding what has happened in our own culture. Origen argues that the logical order of spiritual life can be discerned in the order of the three books of Solomon: Proverbs, which corresponds to a practice of obedience to moral commandments, Ecclesiastes, which Origen himself describes as the spirituality germane to the natural sciences, and the Song of Songs, which corresponds to the experience of ontological love. By this rubric, it makes perfect sense why “religious” people exposed to the natural sciences would enter the perspective of “faith.” This is not the first step towards atheism, but is rather what is supposed to happen in a properly conducted “Religious” life: from obedience, through science, into love. In this context, the problem with contemporary culture could be described as follows: the practitioners of specifically modern science have entered the spiritual life in the wrong order, dissolving the self in the abyss of Ecclesiastes, in the infinite expanses of cosmic time and space, before having cultivated a relatively “selfless” self through the practice of steadfast moral discipline. For those who practice in this way (and especially those who practice with the rigor and single-minded intensity of a German philosopher), reality will begin to manifest as it did to the likes of Nietzsche and Heidegger: as anxiety, dread, and despair – as the inverse of the ontological love that Origen describes as the fruit of a properly ordered spiritual life. On the other hand, for those who enter the abyss in the proper order, through the gate of morality, this anxiety will be akin to St. John of the Cross’ “dark night of the soul” that precedes our encounter with the reality of God. In any event, it seems to me that this would be a better way to frame the debate between “atheism” and “Religion”: What actually happens in the abyss? Does the experience of reality beyond our own parochial cultural training really reveal the “vertigo of relativity” – or is this experience itself just the parochial experience of modern scientific culture, a culturally concocted illusion of the abyss, as an ideological façade that functions to block our view of the truth? 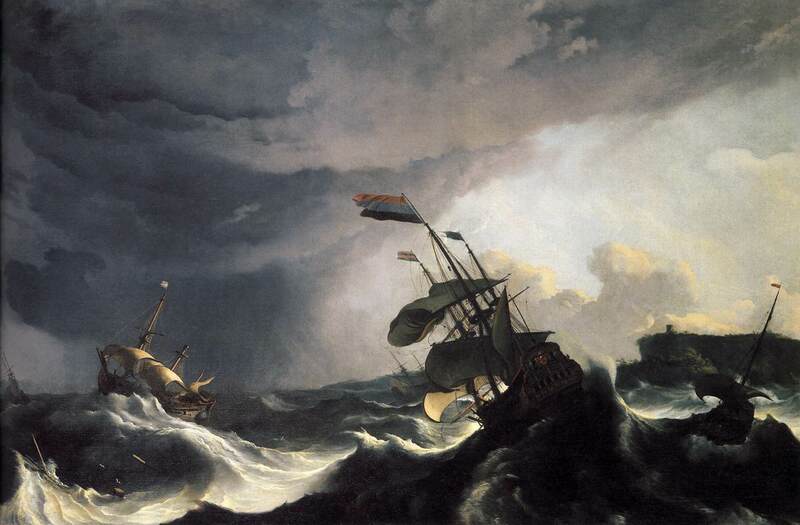 Photo: "Ships in Distress in a Raging Storm," by Ludolf Backhuysen, 1690, used from wikipedia, and is in the Public Domain..
A lovely bit of table turning Joe, written with the panache I have come to expect of your work. The use of Berger's two works as your way in is an inspired stroke. And your "genealogical" turning of the tables at the end, enough to make Nietzsche himself smile before finding some brilliant and sarcastic way of transvaluing anew at your expense. But never mind some imagined contest with Nietzsche, your own contribution to the debate is a worthy bit of argumentation.